Cinema has become over-saturated with sequels, reboots and other shows of the like. Rarely is there a film that can catch the eye or pique genuine interest beyond the quick cash-grab superhero sequel. In an odd way, this is Horns largest selling point; it’s something we haven’t seen yet. It’s daring, new, exciting; even psychotic sometimes. Yet, the bigger question is whether or not the film can stand on it’s own beyond its immediate accolades of shock factor. Is the film daring and exciting – is it worth the time? 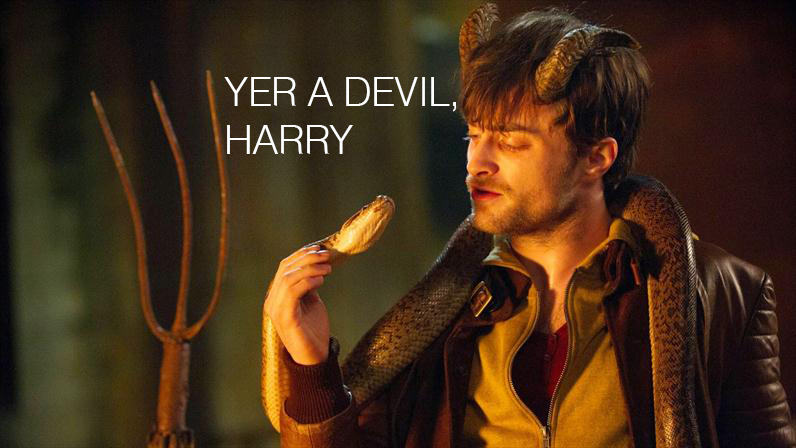 Horns was a straight-to-streaming film directed by Alexandre Aja based on the pulp novel by Joe Hill and stars Daniel Radcliffe – aka Harry Potter. At first glance it’s got the goods to deliver. Sadly, Horns fails to step beyond it’s immediate shock factor. While much of the production is spot on and the cast is perfectly matched, the film crumbles underneath a poorly structured script. For instance, the film cannot keep focused on narrative or vision. Much of the story is told through flashbacks. This not only contributes to the lack of structure in the film but it also steals any possible subtlety in character interaction or development. The structure, it seems, is a wash-rinse-repeat of Radcliffe’s character confronting his enemies, asking them questions, and getting the perfect answer. With a story that seemingly revolves around its characters, Horns is surprisingly an example of the plot being the driving force behind the plot. Just like Snakes on a Plane. Now, that’s not to say the film is without value. On it’s own, Daniel Radcliffe’s twisted, dark, humorous and very human portrayal of protagonist, Ignatius Perrish, is quite fun, frankly. To see the once-boy-who-lived turn into a (the?) devil is quite amusing. Along the same vein, much of the remaining cast is effective. Max Minghella and Juno Temple round out the ensemble. The film succeeds in all production aspects – visual aesthetic, soundtrack/score and casting. For those reasons alone, along with the fact that Horns is, by definition, unique and new, the film is a sight to be seen in theaters. Horns succeeds where most films don’t: in being more than daring and new. But at the end of the day, the film’s failures are much larger. Much of the story progresses with the subtlety of a boa constrictor forcing itself down its victim’s throat and then exploding out through the torso (which did, in fact, happen). Horns may stand on its own with shock factor and short-lived Radcliffe raves, but it won’t be remembered for long.